Just like you should get up on the right side of the bed (or the right side of the sleeping pad), you should wake up with the right cup of coffee. So why do so many people settle for bad coffee just because they're not at home? If you're still drinking instant coffee in the backcountry or trying to shove your home coffee maker into the camper, you know you can do better. Here's our guide for gourmet coffee while camping, no matter what scenario leads you into the great outdoors. The first step to gourmet coffee is the grind - fresher is better. You won't be able to plug you home grinder into any outlets when you're in the backcountry, but never fear: the Javamill is here. The lightweight hand-crank coffee grinder will grind fresh beans for your daily brew before easily collapsing to fit into your backpack. Adjust the grinder for your desired coarseness and crank away - you'll be sipping delicious joe in no time. If you're thru hiking or just spending a few days backpacking (or bikepacking) in the wilderness, you need the proper caffeination to keep you going day after day - especially after sleeping in a tent for days on end. You also need something ultralight and collapsible, no percolators here. Lucky you: the Ultralight Java Drip is just what you're looking for. Wicked light (0.4oz) and fully collapsible, this little guy fits under a standard fuel cartridge and brews a delicious drip every time. No filter needed, so no extra garbage to haul out when your trip is done. Better yet, the legs of the Java Drip clip easily to nearly any mug - so just introduce it to your trusty backcountry mug and they'll be best brewing buds forever. When you've got a tent full of sleepy people, you need a pot full of coffee and you need it STAT. The Javapress is just what you need - a fully portable, easy to use French Press built for the outdoors. Brew up to 50oz of coffee that stays hot thanks to a double walled lid and insulated cozy. Delicious French press coffee just like you enjoy at home - mud free, perfectly brewed, and easily poured. Your campmates will be awake in no time (and they might even help you make breakfast). The added luxury of a roof over your head in a hut, cabin, or yurt means you and raise your pinky high and sip your coffee from a tiny cup. That's right: this scenario calls for espresso. Specifically, the Moka Espresso Pot - sleek and compact, the folding handles mean this little espresso maker is easily stored away in a backpack. Highly conductive stainless steel means you can whip up your morning shot quicker than you can say "highly conductive stainless steel." Easy to use, perfect over any stove, and ultra rugged, this pot serves five double shots to keep your weekend adventures going. This kind of trip calls for simple brews and quick cleanup with minimal gear. When all you need is coffee and you need it quick and easy, choose the percolator. The Glacier Stainless Percolator (available in 8, 14, 28, and 36 cup sizes) fuels your rafters in a single pot. Boil away and watch through the convenient PercView window to see when your coffee is ready. Pour your percolator perfection around camp and keep rolling down the river. 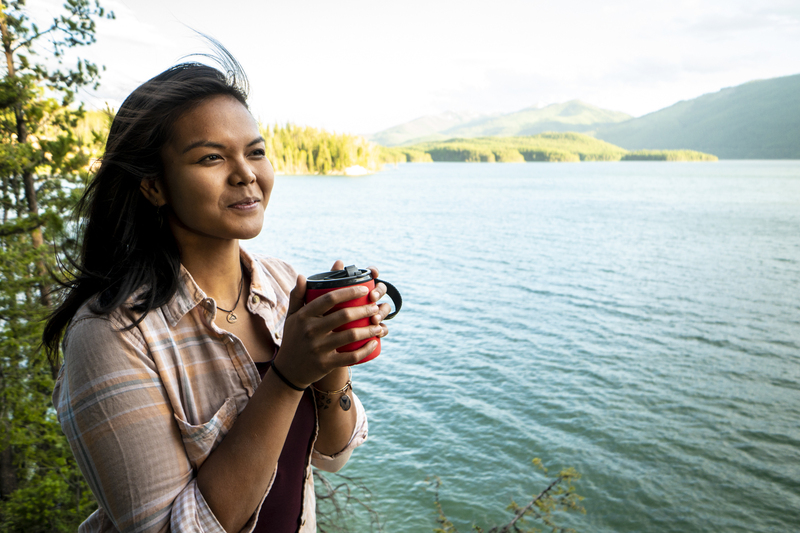 When you're going out on a backyard hike or a day on the lake, you need portable coffee that stays hot during the duration of your adventure. Enter the Commuter Javapress: a travel French press that doubles as a coffee go mug. Add coffee, hot water, and press that inner carafe down - your brew is ready to go. Fits in a cup holder, backpack side pouch, or anywhere you stow away your coffee. This is to-go coffee done right. No matter your adventure, you deserve coffee done right. Wake, sip, and conquer!